Thanksgiving is a holiday rich in tradition that has been refined to a time to celebrate and give thanks with loved ones. The CCA staff endulged in extraordinary food and wine this year surrounded by friends and family. This year, Kimberly celebrated with her beloved and several friends who came bearing a savory-stuffing dish. As a big Cook’s Illustrated fan, her meal inspiration was a collage of recipes both traditional and new. New learned cooking techniques included butchering the bird ahead of cooking followed by braising. Fall was in the air, and in her acorn squash stuffed with wild rice, a favorite dish of her partner Killian. Sweet Potato pie was also on the menu from Chef Charles, made from scratch of course. This year Kimberly made a Persimmon Cocktail created by Allison Evanow of Square One Organic Vodka, called the Golden Gate. The color and flavors are enticing and speak to the pleasures of the fall season.Wines that paired her meal included Grower Champagne to start J.Lassalle and Diebolt Vallois, followed by Seghesio Rockpile Zinfandel, Marquis d'Angerville Volnay Premier Cru, Iron Horse Unoaked Chardonnay. Kimberly is thankful for the humbling effect of the life lessons she learns daily. Katie and family vacationed in Aptos, just outside of Santa Cruz. Her sister is a chef and took charge of preparing most of the Thanksgiving meal, but Katie volunteered to make dessert. 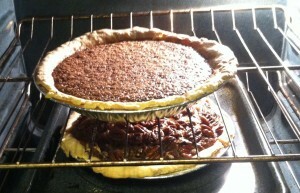 She figured that it's hard to go wrong with the holiday classic of pecan pie, and since they’re a family of chocolate lovers, she opted to make a chocolate pie as well! Their meal consisted of a delicious baked turkey, her sister's homemade chicken-apple sausage stuffing, green beans, roasted and mashed potatoes, and delicious homemade gravy. They also enjoyed plenty of delicious wine pairings with their meal, including Pine Ridge's 2011 Chenin Blanc-Viognier and some Gloria Ferrer bubbly! Katie is thankful to have spent the holiday with my family, who came from different states to celebrate. Skye, had an intimate holiday with family in a very sunny part of California and celebrated a couple family birthdays along the way. This Thanksgiving was particularly stress-free, as everyone was responsible for making something. Her cousins made the pies and mashed potatoes, her father made the turkey and was responsible for the wine, her aunt and uncle made baked squash, her mom made the stuffing and cranberry sauce and Skye made her traditional wild mushroom toasts appetizer, paired with a 1990 Laurent Perrier bottle of champagne, which was unbelievable! Of course, they ended the meal with an assortment of cheeses. Skye is grateful she was able to sit around a peaceful dining table with loved ones when others around the world are not as fortunate to do so. For our intern, Jamila, celebrating is always twice the fun as her family and mother prepare separate meals for the holiday. At home, there is always an intimate celebration between mother and daughter. They cook together, basking in holiday music and cheer, to then travel to the Berkeley Hills and celebrate with family. This year, Jamila made a fresh pico de gallo salsa with a spinach and artichoke dip caressed in the best Italian cheese. 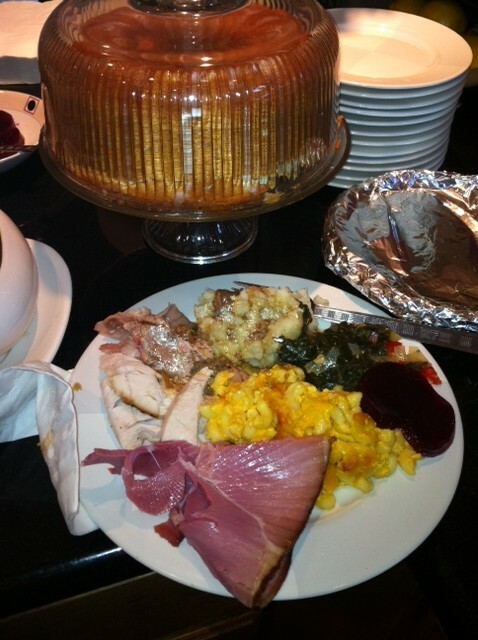 Some family favorite recipes include 7-flavor pound cake, German Chocolate cake, and macaroni & cheese. With family roots of Puerto Rico, Georgia and Ohio, there is always culinary flare in the kitchen during holidays. There is always a space full of laughter, music, and of course good wine. Jamila appreciates every blessing she has had, has now, and will be receiving in the future, from a sound mind to motor skills and everything in between. Drew enjoyed the snow in Utah to spend Thanksgiving with family in Eden, sandwiched between Snowbasin and Powder Mountain, and helped cook great dinner, while watching football and enjoying family. Drew also enjoyed “The Best Burger in Utah.” Unfortunately, their winter has been pretty light thus far so no snowboarding. 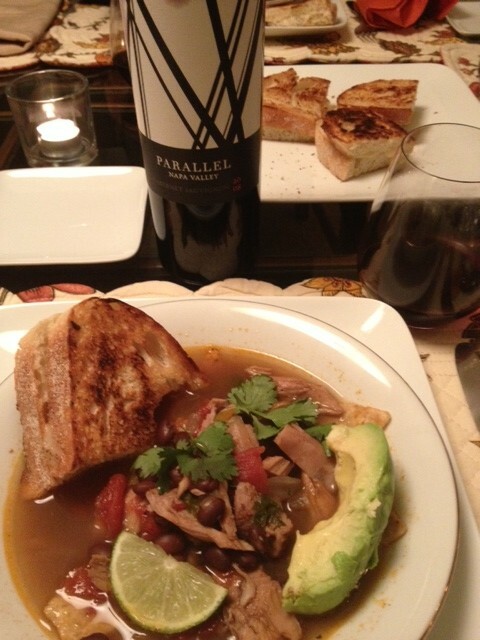 While venturing around Park City, a state controlled liquor store had a bottle of the 2008 Parallel Napa Valley Cabernet, and it was paired at dinner with Turkey Tortilla Soup. Drew is grateful for good health for his family and loved ones.